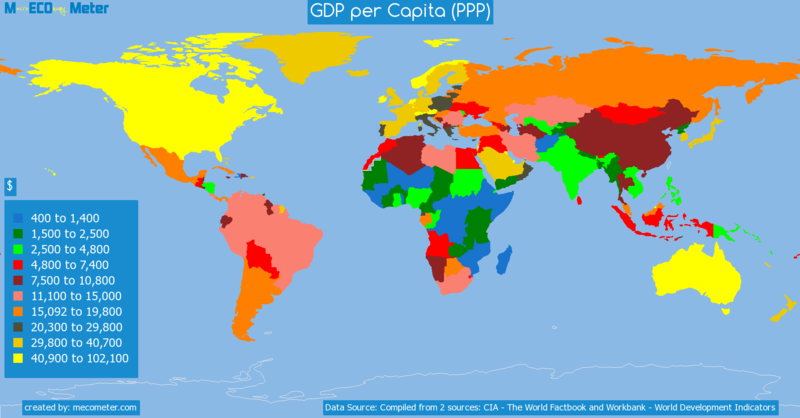 Value & RankThe GDP per Capita (PPP) of Croatia is 17,800 ($) with a global rank of 74. 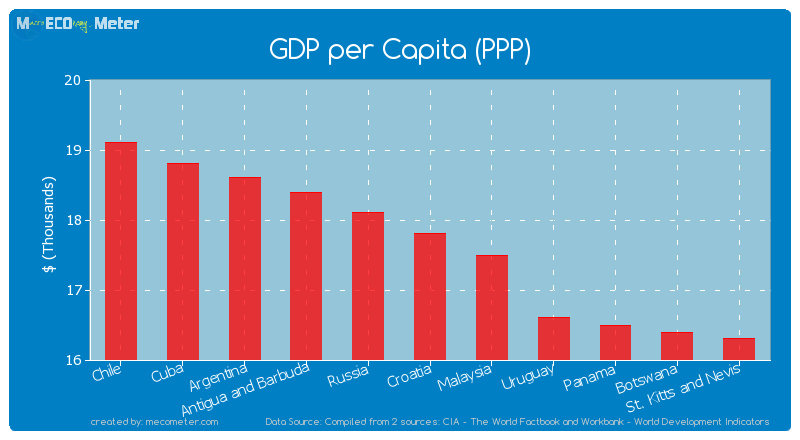 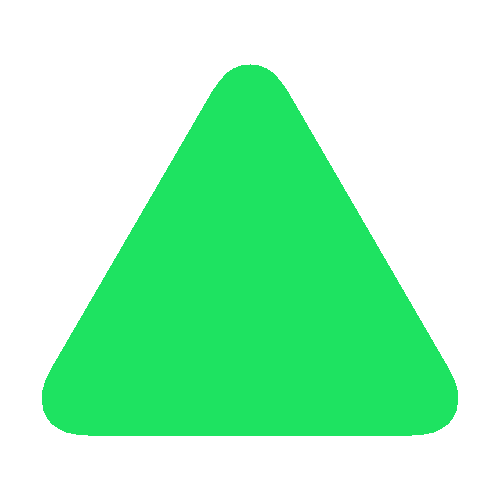 Croatia compared to other CountriesThe GDP per Capita (PPP) of Croatia is similar to that of Chile, Cuba, Argentina, Antigua and Barbuda, Russia, Malaysia, Uruguay, Panama, Botswana, St. Kitts and Nevis with a respective GDP per Capita (PPP) of 19,100, 18,796, 18,600, 18,400, 18,100, 17,500, 16,600, 16,500, 16,400, 16,300 ($) and a global rank of 69, 70, 71, 72, 73, 75, 76, 77, 78, 79.10 years growthCroatia's GDP per Capita (PPP) had a positive growth of 32.6 (%) in the last 10 years from (2003 to 2013). 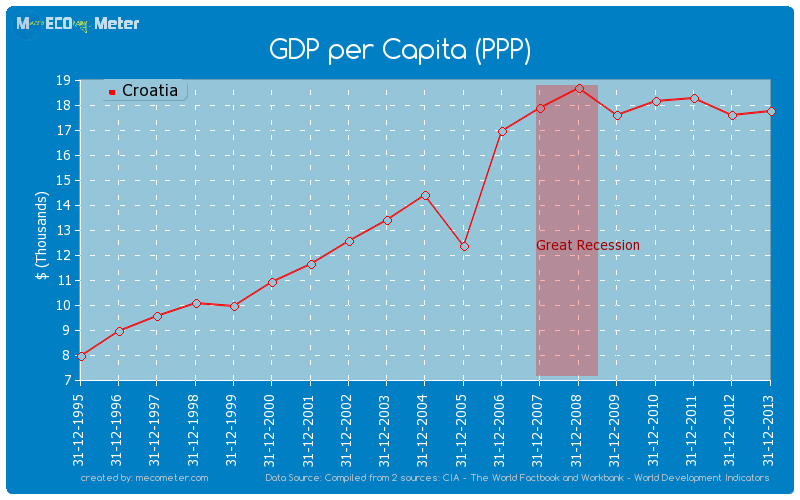 Last 10 years averageCroatia had an average GDP per Capita (PPP) of 16,669 ($) in the last 10 years from (2003 to 2013).